Whether you're selling or advertising on them, coffee sleeves are a hot part of the multibillion-dollar coffee industry. Every day, millions of people rush off to work or read the news with a piping hot cup of coffee they've just bought. These consumers are fueling the $12.27 billion coffee industry and, by association, the coffee sleeve industry. Moving on to the day's next task, however, happens to be a little more difficult if your beverage is singeing your fingertips--a fact that helped the leader in coffee sleeve manufacturing and advertising, BriteVision, grow coffee sleeve sales by 25 percent last year, according to the company. Coffee sleeves also owe their popularity to environmentally friendly coffee lovers who don't want to use another coffee cup to protect their hands. With the bulk of its revenue coming from accounts with companies like Sprint, GM and CBS, BriteVision is anything but a small business. Yet 35 percent of the company's revenue comes from small businesses that make coffee sleeves a key part of their advertising campaigns. Competitor MugToGo plans to give BriteVision a run for its millions in advertising sales next year, says president and CEO Tomas Leszczynski. 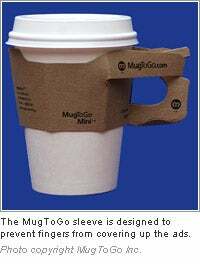 The MugToGo sleeve's design includes a steady handle, which converts the cup into a kind of makeshift mug. Leszczynski says this not only keeps fingers farther away from the heat, but also gives sleeve advertisements higher visibility because fingers are no longer covering them up. 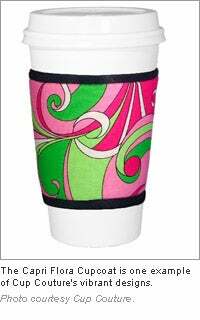 The mug sleeve is also recyclable and comes in a form that doesn't require any more paper than a regular cup sleeve. "It takes me about 15 seconds to convince businesses that our product is better to advertise on," Leszczynski says, adding that he's in talks with several fast-food chains and businesses from Canada and China. After attending the Coffee Fest trade show in Seattle earlier this year, MugToGo acquired orders from more than 200 businesses. But making money in the coffee sleeve industry doesn't necessarily require advertisers or efficient paper use. Sometimes all you need is multi-colored paisley, polka dots or faux chinchilla fur, as Cup Couture creator Kellie Turner well knows. The success of her line of stylish, non-disposable "Cupcoats" helped Turner get through what she says was a scary transition from mechanical engineer to entrepreneur. Turner's mechanical engineering knowledge actually came in handy when developing the product, which is built with a dual thermal core that protects hands and insulates the beverage's heat simultaneously. Her products include a line named after famous divas, a line for men and a line made out of faux furs for those looking for a little more texture. Becoming an entrepreneur had always been a dream for Turner, who says she accomplished several other ambitious goals like traveling across the world before she dared to start her own business. After considering several different directions for her business in January 2006, she invested herself in developing Cup Couture because it combined three passions--fashion, coffee and environmentalism. "Initially the idea attracted me for environmental causes, but then I tied my love for New York into it, bringing environmentalism and fashion together. [The combination] encourages a lot more people to use them I think," Turner says. Word-of-mouth generated much of the product's initial popularity, which has now transitioned into free international media coverage. During the past two years, the demand for her fashionable and thermal insulating Cupcoats has spread from Turner's circle of friends to Rachel Ray and the editors of InStyle magazine. "With a stylish Cupcoat," Turner says, "it makes drinking a coffee a more fun, personalized experience."